Firstly, this is not an announcement, but I do want to update you on some very interesting developments that have occurred over the last few days. 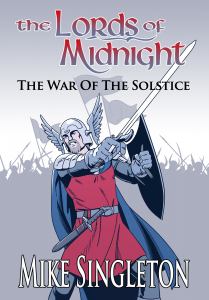 I have had a number of conversations with an established author about the possibility of a Lords of Midnight novel covering the War of the Solstice. We have a tentative understanding in place, and his publisher is also keen, and in principal signed up to the idea. We’ve discussed an overview of what the story might cover, and the timescales under which this would take place. He is currently putting together a general synopsis and outline, as well as some samples chapters. I shall have further conversations with Mike’s family to rubber stamp the approval, with a view to having a fully fledged agreement and a cast iron announcement in the coming couple of months when the full issues have been dealt with. Stay tuned!